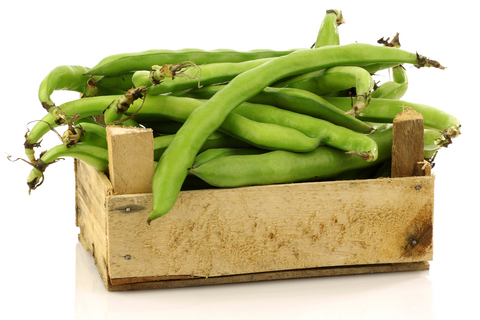 A treat using fresh broad beans as soon as they are ready, probably later in May, early June,and for a short time. Of course you can do this dish at any time with frozen broad beans, but that’s not quite the same is it? This serves 6. Roast, boiled new potatoes or other potatoes and garden vegetables of your choice. With a sharp end of a knife make slits in the lamb and insert the garlic slivers. Give the meat a rub with salt and pepper and place on a rack in a roasting tin. Pour over the oil and roast in a moderate oven at 180°C/350°F (adjust for fan ovens) or gas mark 4 for one and a half hours or until cooked, basting occasionally. Meanwhile, mix the egg yolks, lemon juice and stock together in a bowl. Cook the broad beans in boiling, salted water for 10 to 15 minutes or until just tender and drain well. Transfer the cooked lamb to a carving board and cover with tinfoil to keep hot. Skim the fat off the cooking juices in the roasting tin, then add the juices to the egg yolk mixture and pour into a saucepan. Add the broad beans, thyme and salt and cook very gently, stirring occasionally until the sauce is thickened and smooth. Whatever you do, don’t let it boil, I promise you it will curdle. Serve with the carved lamb and accompaniments of your choice.